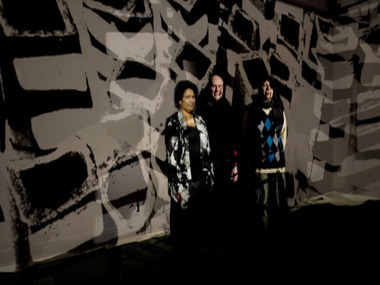 Three Gunnai/Kurnai artists from Victoria’s East, Eileen Harrison, Frances Harrison and Jenny Mullett, have collaborated with renowned projection artist Ian de Gruchy to create a first indoor Koorie art projection exhibition in Melbourne. Entitled Tandeera, a Gunnai/Kurnai word meaning “place of rest”, the projection installation is exhibiting at the Koorie Heritage Gallery in King Street Melbourne, until 21 August. Together, the artists have meditated on the themes of resting and healing post-Apology to create an exhibition that promises to soothe the soul. Important women’s cultural knowledge applied with family art techniques have been combined with Ian de Gruchy’s innovative and inspiring projection method, creating a mystical and enveloping space. A bush soundtrack produced for the installation ricochets around the space, transporting the observer into a Koorie world. “Tandeera is an experience; it’s much different to just looking at something on the wall in front of you”, says Bairnsdale-based artist Jenny Mullett, “Tandeera is a place of contemplation and peace and pause”. 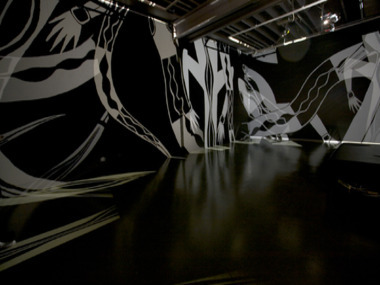 “Tandeera installation required use of pre-digital technologies using orthographic film and programmed slide projectors to translate the artist’s work onto the black painted walls of the gallery transforming the space into a constantly changing immersive projection that is deep and mysterious”, said de Gruchy. Ian De Gruchy, has over twenty years experience as a projection artist exhibiting at ACCA, Museum of Modern Art at Heide, the 1986 Venice Biennale, and collaborating with Barbara Kruger in New York. 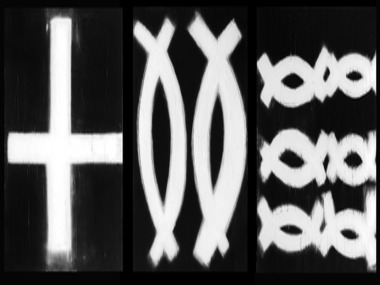 He is interested in the positioning of art within the broader social fabric, and in research into the aesthetic viability of projection to locate ideas within diverse contexts that impact on the public imagination. Exhibition Curator Maree Clarke says the collaboration between Koorie artists and de Gruchy breaks new ground in the way we can experience Indigenous art. “The projection of images and soundscape takes audiences to a new level of involvement”, Ms Clarke said. Proudly funded by the City of Melbourne Indigenous Arts Grants Program. (0417) 303158 or (03) 9663 3222 Image available upon request.